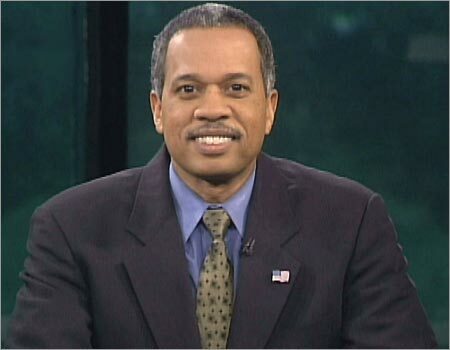 Juan Williams. Canned for political incorrectness. Yes, I too have an opinion about the Juan Williams affair, even though in the world of blogs, something that happened four days ago is ancient history. [The Times Square bomber] said the war with Muslims, America’s war is just beginning, first drop of blood. I don’t think there’s any way to get away from these facts. his remarks on The O’Reilly Factor this past Monday were inconsistent with our editorial standards and practices, and undermined his credibility as a news analyst with NPR. Schiller issued an internal memo on Thursday saying that Williams was fired for violating an NPR principle that states that on other networks “NPR journalists should not express views they would not air in their role as an NPR journalist,” reads the memo obtained by Fox News. “News analysts may not take personal public positions on controversial issues; doing so undermines their credibility as analysts, and that’s what’s happened in this situation,” she added. Many comments supporting NPR equated Williams with radio personality Don Imus (who was fired for calling the members of a girls’ basketball team “nappy-headed ho’s”) and compared his remark to “when I walk down the street and see a black person I get nervous,” which they view as clearly racist. Violent crime peaked in New York city around 1990, and muggings were particularly prevalent. People reported robberies on a regular basis, sometimes in the same place by the same person. The perpetrators were overwhelmingly young black males. Would it be racist at that time and place to say “young black males make me nervous” — or would it just be common sense? Schiller’s and NPR’s responses do not accuse Williams of racism or ‘Islamophobia’. They say that as a news analyst it hurts his credibility when he expresses a personal view on a controversial subject. The view he expressed is certainly personal. But is it controversial that terrorism by radical Muslims in the name of Islam is frequent and bloody today? I don’t think so, no more than saying that New York’s muggers were predominately young black males. These are just facts. ‘News analysis’ is something between straight news and opinion. I haven’t succeeded in finding a definition of it, although almost every media outlet claims to do it. An analyst, I suppose, would take the factual story provided by a reporter and explain how that story might develop, what its relationships are to other stories, why it is important (or not), and ultimately how it might affect people’s lives. It’s hard enough for a news reporter to keep his interpretation out of a story. Could an ‘analyst’ make the value judgments, extrapolations, and even guesses that are essential to his job without letting his personal opinions show? I don’t think so, and of course NPR’s analysts do it all the time — and guess what, so do their news reporters. NPR is obsessed with political correctness for ideological reasons. NPR is uncomfortable with Williams appearing on Fox News. NPR is afraid of CAIR. NPR is afraid of some large contributors. George Soros recently gave them $1.8 million. Since their donor list is not public, it’s possible — actually, I would bet on it — that it receives recycled Arab petrodollars, too. NPR is following what Daniel Pipes calls ‘Rushdie rules’. I don’t know for sure which of these explanations may be true. Probably all of them. I do know that in the US today, free expression about the subjects of Islam, Islamism, and both violent and nonviolent jihad is strongly discouraged. This comes from the top, with both the Bush and Obama Administrations issuing guidelines that restrict the way government spokespersons can talk about these things. NPR and my own local newspaper, the Fresno Bee, seem to have adopted the same approach. I want to one more quotation, to which I can agree from personal experience. When I say something that doesn’t hold to the orthodoxy of the far left, they are far more vicious and personal, ad hominem…than anything on the right. This entry was posted on Thursday, October 21st, 2010 at 9:59 pm and is filed under General, NPR. You can follow any responses to this entry through the RSS 2.0 feed. Both comments and pings are currently closed.